The 'C1P' circular attenuators are one diameter long with a central pod. 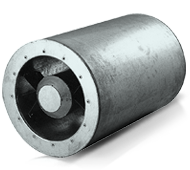 They are generally mounted directly on or close to an axial flow fan. The 'C2P' circular attenuators units are nominally two diameters long. They are generally mounted directly to or close to an axial flow fan.